The House Over-By is just a few steps across the courtyard from The Three Chimneys Restaurant. We have 6 sumptuous bedroom suites and offer attentive service and relaxing facilities throughout the day, from breakfast until bedtime. It is a lovely place to stay overnight, but all of our Restaurant guests may use the Lounge for pre-dinner drinks, or coffee and drinks after their meal. Rooms Our bedrooms are all of the same size, high quality and standard. They all have a sea view. We have a flat-rate Bed & Breakfast Tariff from Easter until the end of October each year. Over the Winter months, we provide Winter Packages for Dinner, Bed & Breakfast at an all-inclusive rate. Please see our Tariff and Winter Offers page. A Room and Dinner: Every guest who books a Room with us automatically has a table reserved for them for Dinner in The Restaurant that same evening. If you wish to reserve The Kitchen Table, please let us. Our Reception Team are happy to discuss your dates and requirements on 01470 511258 or you can email us at: eatandstay@threechimneys.co.uk. 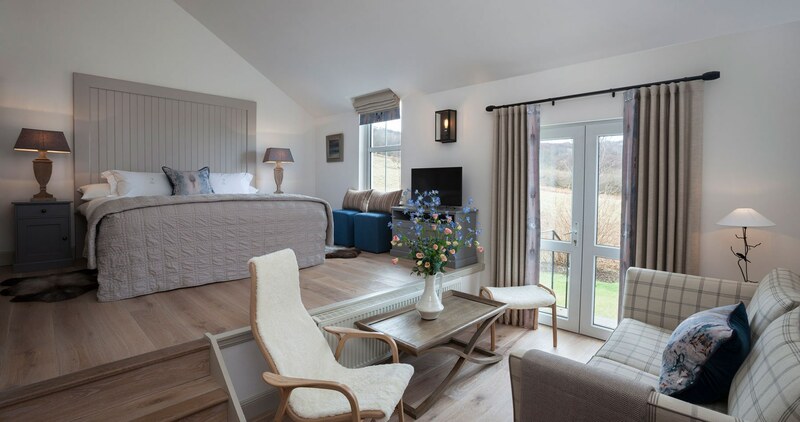 Breakfast: A full Scottish Breakfast is served in the Lounge of The House Over-By, with its stunning, panoramic views over Loch Dunvegan, the Minch and the peaks of Harris and North Uist. We have binoculars for those who want to enjoy a closer look, or perhaps spot the seals in the loch outside the window, or even an otter or a heron on the shore. For breakfast you will have a full range of hot dishes to choose from, served at the table by one of our restaurant team. Afternoon Tea: Every guest is welcomed with the offer of a freshly prepared afternoon tea tray and home baking upon their arrival. We do the same each day when you return from exploring the island. During the day, house guests can use the Lounge area to relax and unwind. A Lewis chess set is set-up permanently here and there are jigsaws and board games, books and periodicals to browse through. Free Wi-Fi is available throughout the building. Evening Drinks: At night when the stove and candles are lit, house guests and restaurant customers alike, may use our Lounge areas to enjoy pre-dinner drinks and cocktails. We have an excellent Drinks List, a choice of Scottish gins including our own The Three Chimneys Small Batch Gin, and of course, a whole array of Scottish malt whiskies from which to sample a dram before or after dinner. The sea views are beautiful and take-on a whole new aspect, especially at dusk, in moonlight, or during the long hours of daylight in Skye summertime. On a clear night, with an array of stars in the sky, you may even be lucky enough to catch sight of the Aurora Borealis from here too.